The Brush High School National Honor Society just wrapped up an extremely successful Thanksgiving Food Drive. Students, staff, and community members came together and demonstrated why South Euclid and Lyndhurst are such remarkable communities. The National Honor Society collected countless bags and boxes of food items and more than $650. The National Honor Society was able to organize and supply 10 local families with Thanksgiving dinners and more. On November 19th, the officers of the National Honor Society delivered the food items. Each family received generous portions of non-perishable food items and a gift card. 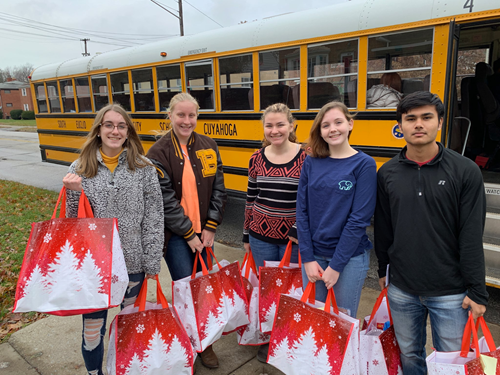 In addition, so much food was collected, that the National Honor Society was able to donate a significant quantity to the Garfield Memorial Church, an organization that provides food to families in the surrounding communities. We would like to send a heartfelt thank you to everyone who contributed. Many of the recipients expressed tremendous gratitude for the generosity of everyone involved.